Natan Sharansky is one of the most famous former Soviet refusniks and an Israeli politician, author and human rights activist. Sharansky (born January 20, 1948) was born and raised in the Ukraine (then part of the Soviet Union), and graduated with a degree in mathematics from the Moscow Institute of Physics and Technology. 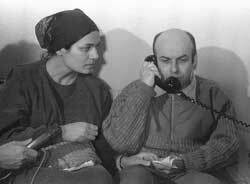 Early on, Sharansky got associated with the human rights movement when he became an English interpreter for Andrei Sakharov. Later, Sharansky emerged in his own right as one of the foremost dissidents and spokesmen for the Soviet Jewry movement. In 1973, Sharansky applied for an exit visa to Israel, but was refused on “security” grounds. Following this denial, Sharansky became more overtly involved with the refusnik movement and became an activist for Soviet Jews. He remained prominently involved in Jewish refusenik activities until his arrest in 1977. In 1978, Sharansky was convicted of treason and spying on behalf of the United States, and was sentenced to thirteen years imprisonment in a Siberian forced labor camp. For the first 16 months of his sentennce he was held in Moscow's Lefortovo prison, frequently in solitary confinement and in a special “torture cell,” before being transferred to a notorious prison camp in the Siberian gulag. Years after his release, Sharansky stressed the need he maintained throughout his imprisonment to remain emotionally independent. He attributed his survival of the lengthy incarceration and the brutal conditions to his resistance to any sort of emotional surrender. Hence Sharansky's expression of the paradox that while an ordinary Russian, he was in fact a slave to the system; but that once he discovered his Jewish roots and was restricted for his allegiance to them, he was in reality a free man. Sharansky's memoirs of his years as a prisoner of Zion are described in his book Fear No Evil. During the years of his imprisonment, Sharansky became a symbol for human rights in general and Soviet Jewry in particular. A campaign for his release was waged tirelessly by his wife, Avital, who emigrated to Israel immediately following their wedding with the hope that her husband would follow shortly. Intense diplomatic efforts and public outcries for his release were unsuccessful until 1986, when Sharansky was released as part of an East-West prisoner exchange. Sharansky became the first political prisoner ever released by Mikhail Gorbachev due to intense political pressure from Ronald Reagan and the United States. Freed on the border of a still-divided Germany, he was met by the Israeli ambassador who presented him immediately with his new Israeli passport under the Hebrew name of Natan Sharansky. He arrived in Israel on February 11, 1986, and was greeted by leading government officials, including then Prime Minister Shimon Peres, and was given a hero's welcome. In 1988, he was elected President of the newly created Zionist Forum, the umbrella organization of former Soviet activists. He also served as an associate editor of the Jerusalem Report. Increasingly disappointed with Israel's absorption of the large influx of Soviet Jews, he wrote frequently on the subject, and in 1995 created a new political party, Yisrael b'Aliyah, dedicated to helping immigrants' professional, economic and social acculturation. In the elections the following year, the party won seven Knesset seats, and Sharansky was named Minister of Industry and Trade. Sharansky served as Minister of Industry and Trade from June 1996-1999. He served as Minister of the Interior from July 1999 until his resignation in July 2000 and as Minister of Housing and Construction and Deputy Prime Minister from March 2001 until February 2003. In February 2003, Natan Sharansky was appointed Minister without Portfolio, responsible for Jerusalem, social and Diaspora affairs. Sharansky resigned from the government on May 2, 2005, because of his opposition to Ariel Sharon's disengagement plan. He had served in four different Knesset governemnts. In November 2006 Natan Sharansky resigned from the Knesset and assumed the position of Chairman of the then newly-established Adelson Institute for Strategic Studies of the Shalem Center in Jerusalem. In June 2009, he was elected and sworn in as Chairman of The Jewish Agency for Israel, a post he still holds. Natan Sharansky's memoir, Fear No Evil was published in the United States in 1988 and has been translated into nine languages. Another book, The Case for Democracy: The Power of Freedom to Overcome Tyranny and Terror (2004) attracted wide-spread attention and was famously quoted by President George Bush during his presidency. Sharansky's latest book, Defending Identity: Its Indispensable Role in Protecting Democracy (2008) is a defense of the value of national and religious identity in building democracy. He also maintains a website and blog. He is married to Avital and has two daughters, Rachel and Hannah.